Personally I’m not much of a fan of horror movies, and you can keep all of those torture movies but I do love me some monster movies. Not just Godzilla and Gamera, though I do love them too but also stuff like ‘Them’, ‘The Thing’, and ‘Tarantula’. I used to really love big bugs gone wild movies until the Sci-Fi network almost single handedly destroyed the genre. This brings us to the decidedly lower budget but none the less very effective monster / horror movie ‘Splinter’. This one I liked. Plus it has the lady from those Lincoln / Mercury commercials in it as the star, possibly the hottest product spokesperson on the planet earth. Not counting those chicks who show up on TV after midnight trying to get you to call their chat lines. Seth (Paul Costanzo) and Polly (Jill Wagner) are a mix matched pair of love birds cruising around the back woods in Polly’s Ford Explorer looking for a spot to do some camping. Like Daniel Craig can’t wear a tuxedo in a movie unless it’s a 007 flick, apparently Jill Wagner can’t drive a car in a flick unless it’s a Ford product. Anyway, though I thought I clearly saw a sign that said ‘Stay Out / Do Not Enter’, apparently our love birds didn’t see this sign. Not that it matters much because like most urbanites who try to ‘camp out’ the pair doesn’t have slightest idea what they’re doing, end up busting up the tent and are back on the road looking for a hotel to spend the night. Unfortunately our pair runs into Bonnie and Clyde over here in career criminal Dennis Farrell (Shea Winningham) and his junkie girlfriend Lacey (Rachel Kerbs) who put a gun to our couples head with the plan to proceed to parts unknown. On the way to these parts they run over something in the road which completely f’s up the tires on the Explorer, with the junkie believing that it’s her dead dog. It isn’t. It’s something much worst. Just don’t let it touch you… OOOPS! Too late. Whatever this thing is they ran over, which has already killed and kind of possessed a gas station attendant in the films first scene, it also punctures the radiator forcing our heroes to pull into said gas station where all hell breaks loose. This particular monster, origins stemming from what I’m thinking are fruits of the evil oil companies, has no feelings, emotions, brainwaves or nothing. Just the instinctual need to be parasitical – which amazingly is a real word – and consume. And it is ugly in the way it takes over its victims. Ugly, violent, bloody and brutal. Locked in the gas station with our hungry monster just itching for any opportunity to stick ‘em, the hottie, the nerd and the criminal – the junkie is no longer with us, at least in the classic sense – must find a way out of this mess before… well actually I don’t there is a way out of this mess. There’s nothing too terribly complex about ‘Splinter’ as its basic narrative has no twists that we need to worry our simple minds about and there’s hardly any exposition in the outside world influencing our three sitting ducks in the gas station as the gas station is their whole world. Even though the story is the monster, the monster is pretty damn simple too since we really don’t know where it came from, and I am glad some evil government / oil company executive didn’t show up to explain everything away as tends to happen in movies like this. 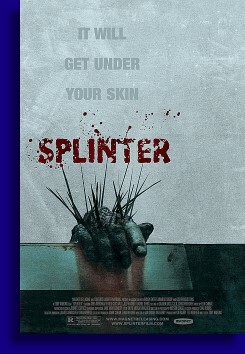 No sir, what we have with ‘Splinter’ is a simple, straight forward, linear monster movie. And we’re happy with that. Director Toby Wilkins does take the time to separate and distinctify his characters – and if you’re wondering distinctify is not a real word. But with his characters, we did appreciate that the time was taken to give them all unique personalities which in the long run assisted them in attempting to over come the extremely unfortunate situation they found themselves in, and to that end all four of the main actors did a fine job with their respective roles. Now admittedly all is not golden with ‘Splinter’ as some of the situations we were given and some of the characters actions were a bit head scratching. Without giving away the movie I thought once our genius nerd found out a weakness about our monster, me and the wife thought there were a myriad of ways he could’ve made his move than what he eventually came up with, and don’t get me started about the cop who shows up at the gas station who after seeing the spiky deformed body on the trunk should’ve either called the National Guard or as I would’ve done, quickly realized that discretion is always the better part of valor and then got into my squad car and driven away. There are a few little narrative flaws and hiccups along the way which try to derail ‘Splinter’, but then it is a movie about crazy kids being attacked by detached spiked out body parts so this is to be expected in spots. Despite some issues we may have had, ‘Splinter’ was some damn fine entertainment worthy of anybody looking for a solid monster movie on a cold winter weekend.